Following the success of the Teen Titans multi-part statue, DC Collectibles is back with a new line of combinable statues, this time featuring the Bat-Family! This new set features five statues that can be posed individually or combined into a massive showpiece. The latest release of the Bat-Family is the Boy Wonder himself-Robin! 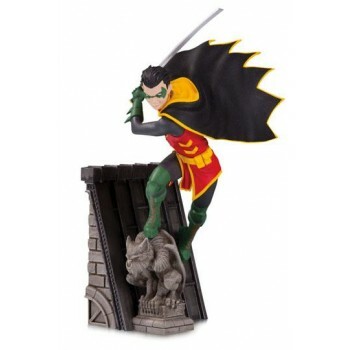 Perched upon a gargoyle with a sword at the ready and a smile on his face, this Robin is ready for action. Carefully sculpted in polyresin, this statue will stand out on its own or as part of the family when connected with the other statues of the collection. Limited to 5,000 pieces. Individually numbered. Statue measures 15 cm tall.